Giant's Run is a region located in the hold of Eastmarch, which is a part of the province of Skyrim. The capital of Giant's Run and Eastmarch is the city-state of Windhelm, located along the Yorgrim River towards the Sea of Ghosts. The holy forest of Kynesgrove takes up the southern portion of the region towards the Velothi Mountains. The township of the Lower Yorgrim occupies the other side of the Yorgrim Estuary from Windhelm, hence the name. 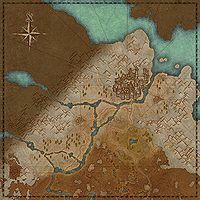 Towards the mainland are several strongholds including Morvunskar, where the royal family of Windhelm is buried, among other warriors of Ancient Skyrim. And then there was the Ancient Orcish stronghold of Cradlecrush, which is further inland than the rest of Giant's Run. This page was last modified on 20 December 2017, at 19:21.